I am an old gamer. Started playing the “pencil and paper” version of “Dungeons and Dragons” back in the early 80’s, and have been hooked ever since. What does this have to do with the events of the past few years both nationally and world-wide (including the tragedy which took place in Connecticut, and more recently, Boston)? Give me a second or two and I will try and explain. Lawful Evil Characters of this alignment see a well-ordered system as being easier to exploit, and show a combination of desirable and undesirable traits; while they usually obey their superiors and keep their word, they care nothing for the rights and freedoms of other individuals and are not averse to twisting the rules to work in their favor. Glad you asked that Sparky, sometimes even games may provide insights as to what drives man to do what he does. So here are a couple of examples to prove my point. It is no secret, to those who happen to drop by here, that I am strongly opposed to Islam. It is a malignancy which masks it’s true intent under the guise of “religion”. And yes, there are most certainly good people who are followers of the “faith”. However, one would suspect they are doing so because of expediency, ignorance, or stupidity/naiveté …. what other reason could there be, assuming your nature was “good” to begin with? Anyhow, back to the point I am trying to make. Islam is a beautiful example of what could (or should) be considered “Lawful Evil”. There are specific rules, guidelines, and regulations which all are required to follow. You may be able to “get away” with not following some of these, especially if you are in some position of power and or authority within the particular sect you adhere to, but if someone else is in a position to challenge you or has power over you, this may be called into play, and your indiscretions could cost you. Perhaps an example a bit closer to home is in order. Okay, how about the Senate and Congress, a large chunk of the Judicial, and most (if not all) of the Executive branch. Yep, talking about the Federal Government. Oh, and let”s not forget about all the alphabet agencies and the government bureaucracy at large. Much like the first example, there are some who are honestly trying to do “good”, or are “good people”, but more and more, logic dictates they would fall under the same categories as the so called “good Muslim”…. expedient, ignorant, or stupid/naive. And yes, I am calling the government, as it stands (others would say it has been this way for quite some time, and they very well may not be wrong) , Lawful Evil. The above are just two examples, done without breaking a sweat. There are others. Trade unions…hell, unions in general comes to mind, that meet the requirements for this brand of Evil. I am sure you could think of more. Chaotic Evil Characters of this alignment tend to have no respect for rules, other people’s lives, or anything but their own desires, which are typically selfish and cruel. They set a high value on personal freedom, but do not have any regard for the lives or freedom of other people. Any serial killer, assassin, or “crazed gunman”, up to and including Adam Lanza would fall into this category. Arguably there could be a few heads of state here as well. Here you will find the misfits, loners, malcontents, The Narcissist, (yeah, that Narcissist) More importantly (though it may be something only admitted to themselves. In the darkness of the pit where their soul should have normally resided) they find some sort of perverse pleasure in seeing others brought to some level of physical or emotional pain. It is random senseless Evil. With no apparent logic or grand design behind it….Evil purely for the sake of evil. The two alignments, may be easily used to “profile” most, if not all, of the horrific acts of violence which have gain national prominence over the course of the last 40-50 years. You can take all the players involved and they (and or their groups) will fall under one of the above alignments. Which brings us to the title of tonight’s post. It isn’t the availability of fire arms. For, time and time again, those of an evil nature and or intent, will find a way to acquire same if they feel the need to do so. Take away the firearms, knives, clubs, arrows, rocks and stones, would still be available, And failing that, there is always brute force. No, guns are not the real concern here. It isn’t the lack of (constitutionality of any and all of them put aside for the moment) laws. We have more gun laws and “legal” restrictions placed upon us (you know, the law abiding folk) in the process of trying to procure same. There are numerous laws addressing potential abuse/violence, not only against individuals (women, gays, police, teachers, public officials) but groups as well. Everything from “orders of protection”, to the added charges of “a hate crime”, and “aggravated ______”. These will not stop those who are well and truly bent on carrying out their acts. The same thing goes for all the “drug free, gun free, smoke free, and any other “free zone” placed into effect via proclamation (and or law). How many schools (at all levels) have been kept safe and secure purely on the basis of them being “gun free and or violence free zones”? How many (especially at the upper echelons) constantly observe the “smoke free environment” of the office (or more informally, the campus) they are on? And “drug free zones” in public schools (especially at any major metro school district)…you can not be that naive, can you? It is not any of these things which are killing people. And none of the above, are in any great measure, preventing people from being killed. It is the content and quality of the character of all the perpetrators which is the root cause. Character matters. Evil does exist. 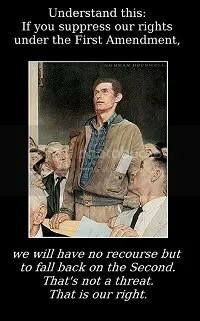 And the sooner people wake up and realize this, and take realistic action against same, then the first steps will have been taken to return our society and with any luck at all, our nation back into something our forefathers would not only recognize, but be proud to have given birth to. There is enough blame for how things have arrived to where they are now, shared by all sides; left, right, and center. And none of them are really offering any sort of honest and or realistic solution to the many concerns this country is challenged with at this point in time. Hell no. Heck, I am not even sure of some of the questions. However, it would seem to me if we adhered to at least some of the following, we would eventually arrive closer to where the majority of folks really want to be…or would at least be comfortable with same. 1. Follow the Constitution, as written. This is suppose to be the legitimate framework with which everything else evolves from. So follow the damn thing already. Not because it happens to agree with your (or your group, party, agency[s], particular agenda at the moment, but because it IS the binding document all are supposed to work under. If you don’t like the rules, either go about the proper ways set forth in said document, to change same, or failing that, get out of “this club” and go somewhere else. If you are a member of the government (be it civil or military), at some point or another you took an oath to either protect and defend same, or at the very least to be honor bound in following it’s proscribed tenets. To do anything less should be cause for, at a minimum, immediate dismissal from your position, at at most being hung from the neck until dead. (Other modes of “permanent dismissal” are optional, this was just the first which came to mind.) That we have any number of current office holders (regardless of party affiliation) who have acted, or are currently acting in manners that in the past would have been considered treasonous…but are now looked at as little more than “business as usual keeps my blood pressure at levels that are at best unhealthy. 2. Leave me alone…and get the hell off of my lawn!! In other words, keep your nose out of other people’s business, as long as it doesn’t impact you, your family, or friends. We used to pride ourselves as being a nation where independence of spirit, and self reliance, were admirable qualities. That one’s ultimate goal was to be “a self-made man”. You might be accepting of charity (The real deal, not the faux version better known as “government assistance”.) but you made damn sure you paid those who helped you out back at the very least as much as was given. In turn, if your neighbor had fallen on hard times, you helped out when you could to get them back on their feet. You might also be tolerant of your neighbor(s) idiosyncrasies as long as they were not negatively impacting you and yours, as they would be of yours. So when did we become a nation of busybodies? A land of Mrs. Kravitz-ies…your grass is too high….your flag flies too often…your garden/farm produces too much of the wrong kind of produce. You can not sell untreated dairy products to the masses… your smoke is polluting my air (outside no less)…and the list goes on. In short, most folks just want to be left alone. We don’t want the State (be it federal. state, or local) interfering with our lives and or our businesses. Personally, the next political or media type who utters the words; “It’s for your own best interests!”, or, “But it’s for the children!”, should be tarred and feathered, and promptly run out of town, on a rail. And that is if I am in a good mood at the time. 3. Take care of yourself, and if applicable, your family and friends. Charity should begin at home and to the local community. Used to be you belonged to a church, community group, or perhaps to some fraternal organization (Knights of Columbus, Masons, Elks, etc) which had as part of their activities, some sort of charitable arm. These were in place to help those who may have fallen on hard times, or help rebuild the community should some sort of calamity effect same (tornado, flood, etc). And, as mentioned above, the “faux charity” currently pushed at all levels of government, is anything but. This is as good a start as any. I imagine you can think of a couple more. There will be more on this (and related topics/issues) to come. Comments, as always are welcome. The following was penned by my oldest. Of my three sons, he is perhaps the most conservative of the bunch. With all the gnashing of teeth, and wringing of hands due to the Supreme Court deciding as they did on the ACA (and I admit I was gnashing and wringing with the best of them), Stephen is of the opinion, Chief Justice Roberts did exactly the correct thing, in getting it called a “tax”, and thus ruling on such. I will not break down what is essentially his post, here. He has said much that I agree with, but the’re a few things I would take issue with. This will be done after I have read the opinions and (perhaps) the dissent. For now, read what a young, college educated, take is on this mess. I shall forward any comments to him (though I am sure he’ll willingly rebut in the comments as well). Early today, SCOTUS ruled 5-4 that Obamacare was constitutional. Chief Justice Roberts was the swing vote, and in his affirmation wrote that it was in fact legal based on Congress’ duty to hand out taxes. As a conservative, I cannot necessarily argue with him. As someone who does not agree with almost everything the current President has done, I cannot find fault with their argument that the individual mandate was in fact a tax and not a penalty. Roberts believes that the constitution should be read as a historical document. A list of laws meaning the same thing now as at the time it was written (and amended), not a twisting-turning living document, and it was this premise that led to him voting in favor of Obama and his law. He did exactly what President Bush nominated him to do; continue the practice of reading the letter of the law. On that, I applaud Roberts. The argument of a tax was how the Administration argued their case, and the tax is how they won the day. It is now Congress’ power to tax Americans (those that actually pay taxes, that is) for anything that they see fit. No longer will Americans be able to choose their financial destiny. If you do not drive, why shouldn’t you have to pay a penalty for not having car insurance? If you do not own a home, why then wouldn’t you have to pay for home insurance? If you do not own a firearm, why then wouldn’t you purchase ammo? Whenever the Government needs more money to support a specific program, get ready to empty your pockets that much more for funding more for others that choose not to fund their own lives. It used to be that American was a land of choices and personal responsibility. Those days, according to the Supreme Court have ended. That is simply one part of this decision. The main part of today’s decision are the political ramifications that will come. Obama and Friends spent the entire debate of this health care law explaining how the individual mandate was in fact NOT a tax, but a penalty. It was to be the first time in American history that Americans will be penalized for not purchasing a product they do not choose to have. That was the first slap in the face to those citizens who have made a choice for themselves. Further, Obama himself ran his campaign on not raising taxes on the middle class. This gigantic taxation that will fund the HCA will now fall on the shoulders of who? That’s right, the middle class (and the others who actually pay taxes). Now, all Americans (who pay taxes) have been given a collective hypocritical slap in the face. So who will have to pay for their health care? Who will be able to receive free government sanctioned health care? Will the poor have to pay individual mandate taxes? If the answer to the latter is “no”, then how is that fundamentally fair for those who pay in, but yet see no benefit? Does Joe Wilson’s “you lie” outburst become true when it is found that illegals will find their way to reap the benefits of this new law? Even with the passage of the bill, which was done under a cloak of secrecy, even the debate of the law through the courts, the American people have been lied to and deceived. The devil is in the details and this law still provides more questions than answers. Obama and Friends will now have to tap dance around over the next 4 months prior to the election to explain why they have now slapped the majority of the country with an enormous tax burden. It used to be that SIN taxes were a loop hole in which to tax unhealthy choices for the betterment of the general public, but only on a state level. One could argue whether or not these taxes are regressive, or even fair on a utilitarian approach, but these taxes are a state’s issue: now that power has been granted to the Congress. What will be next?